As much as you’re probably aware that videos come in many different formats, you can largely afford to ignore them – until you run across one that you can’t seem to play. That is when you may try to look for special players that can handle that format, or some other way to make it compatible. The best way to ensure that your videos are compatible with any device or platform is to be able to convert them to the right format at the drop of a hat. While converting video formats effectively may seem hard, Movavi Video Converter can help with that. Essentially you can convert your videos to and from any format using Movavi Video Converter by just adding the video and selecting the format that you want to convert to. For example if you want to convert AVI to MOV then you’d select one of the MOV presets under the ‘Video’ tab. In some cases you might not be sure which video format is best, and if so you can use the presets for various devices and platforms in Movavi Video Converter instead. When you select one of these presets it will automatically optimize the video format and settings accordingly, allowing you to effectively convert the format and ensure it is compatible. At the same time you could also compress your video, or adjust its other parameters manually if you prefer. Suffice to say you should be able to quickly and easily convert your videos into precisely the right format without any hassle whatsoever. However that is just the tip of the iceberg, as Movavi Video Converter has a lot of other features that you may want to explore and experiment with as well. Simply put Movavi Video Converter can not only convert videos, but also image and audio files too. 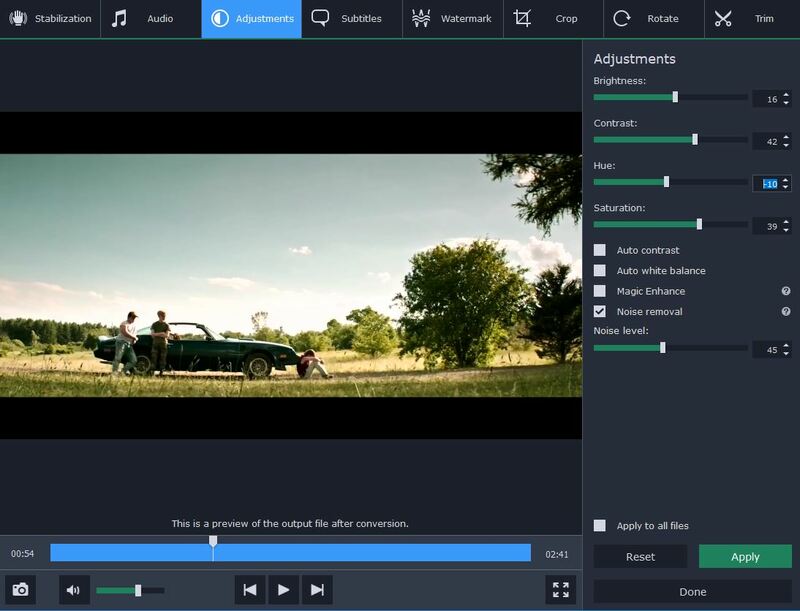 It can be used to create animated GIFs, extract audio tracks, save frames of video, or edit video footage by cutting and joining segments, enhancing the video quality, adding captions, and so on. As you may notice the features in Movavi Video Converter are designed to give you the tools you need to prepare your videos in a variety of different ways. Because of that it ends up being a multifaceted utility that will give you a wide range of capabilities so that you’re well-equipped to deal with almost any eventuality.